A compilation of actual questions I have fielded in the streets over the past 2 years…. Q: Is that a Jack Russell? A: No, its a Smooth Fox Terrier. Q: Is that Eddie from Frazier? A: No, that dog is a Jack Russell. This is a Fox Terrier. Q: Is that Wishbone?! Wishbone! Wishbone! Wishbooooooooone! A: No, Wishbone is a Jack Russell. This.Is.A.Fox.Terrier. Q: Is that some sort of Jack Russell mix? A: No. Just a Fox Terrier. 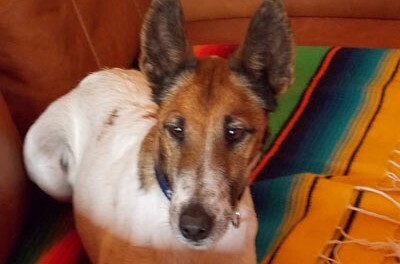 A purebred, Smooth Coat Fox Terrier. Q: Hey look it’s Jackie! Hey Jack! Hey Jack, Hey, Jack Russell. Hm. IS that a Jack Russell? You see what we face? Our dogs are an ancient and noble breed. Pliny the Elder, in his Natural History, described with amazement the “earth dogs” and specialized fox hunting dogs the invading Romans found in Britain — dogs that were found nowhere else in the known world. 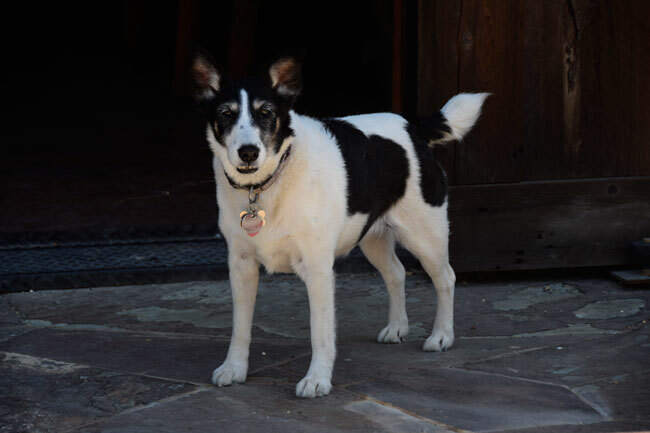 From then, the Smooth Fox Terrier was developed and refined, probably descended from an early type of smooth black and tan terrier, then mixed over the centuries with Greyhounds and perhaps Beagles and Bull Terriers. By the 1700s, the breed was already pretty well known and much in its current form. By the time breed associations and dog shows were starting up in the 19th Century, terriers, specifically Smooth Fox Terriers, were dominating the Best of Show awards. If you are an aficionado of early advertising art, you’ll know that ads that often had not the remotest connections with dogs — like cigarettes, cars and baby food — would often feature a Smoothie, possibly for the cuteness effect. We’ve had a Celebrity Smoothie Encounter. But Oscar’s not anywhere near ready for his close-up. 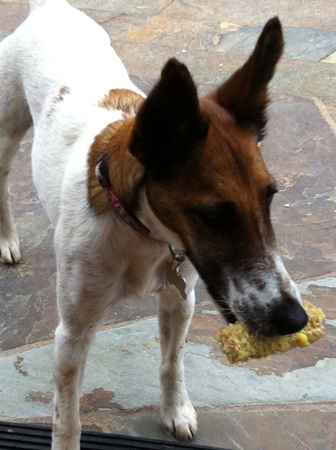 Here he’s looking like a Hayseed Terrier, complete with corn cob. Alas, all those things that used to make Smoothies prized — tenacity, ability to think for themselves, rat catching, proper behavior and their accessorizing potential during a formal English fox hunt — became less and less needed. What the public increasingly wanted was a big couch potato dog that that would need minimal training and supervision and would fit into a more urban lifestyle. Enter the Labs and Golden Retrievers. Exit Fox Terriers from the popularity contests. But that didn’t matter to us Terrier Lovers. We just went underground. Even without our canine companions, we know each other by secret handshakes and the pet toys we buy. Terrier owners can often be heard quizzing pet store employees, “Will this toy survive being passed several times through an industrial combine or threshing machine, because then maybe my dog will get a month or two of play out of it.” And Terrier owners will “climb ev’ry mountain, ford ev’ry stream” to connect if they get even the merest hint that another Smoothie owner is within sniffing distance. 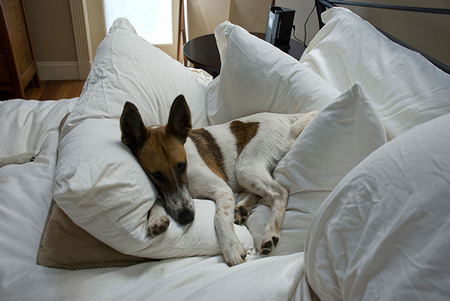 Oscar may not share the well-groomed good looks of some terriers who travel in more exalted circles, but he feels they’d all agree on the important points — such as the value of high thread count Egyptian cotton sheets. Anyway, this is a long piece to lead up to the fact that I just got the ultimate Smoothie shout-out. 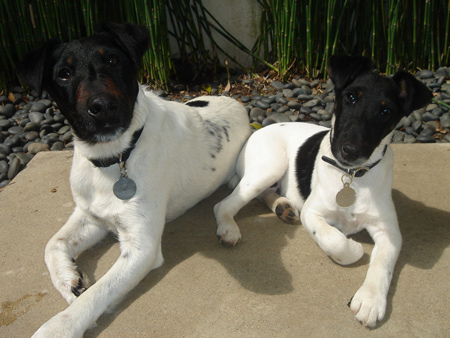 I had been told by a breeder and friend of Tom Ford and his companion Richard Buckley that they had enjoyed the terrier posts here. And I did see some hits coming from New Mexico where I know the two of them have a vineyard (what is it about Smoothies and wine grapes that goes together so perfectly?) But still Oscar and Lucy hadn’t been assigned their casting session in spite of flexing their range on these cyber pages. Then out of the blue yesterday, a lovely email from Richard Buckley containing charming Smoothie stories and pictures of their dogs, Angus and India, the stars — sorry Colin Firth and Julianne Moore — of A Single Man. I shared the news and the email with a few Smoothie owners, which immediately resulted in a blanket invitation for Tom and Richard, India and Angus to stop by various points for playdates and refreshments. We are over the moon and Lucy already has a serious crush on Angus. Oscar thinks India would like to join him in Lake Charles (named after our dearly departed Founding Terrier) and he wants to remind her that he knows where all the lizards hide out. Tom and Richard’s Smoothies, Angus and India, at four years and six months old respectively. Can’t you just see them romping through the vineyards with Oscar and Lucy? And hey, folks, it could happen! In an age when coalitions and old alliances are breaking down, the Smoothie Bond remains strong. Granted Tom and Richard are sitting on top of the world after two illustrious careers in fashion and tastemaking, but should they ever be hard up for the next bowl of kibble, I know Smoothie owners from Michigan to Memphis and points East and West who’d load up the dog crates and be there as fast as possible. But maybe I shouldn’t emphasize that too much. While so many of us are worried that our investments are shrinking, our mortgages are underwater, Social Security won’t be there when we need it and the government has decided it has no obligation to give us a hand, Smoothie owners know that we’ll always take care of our own. Clearly the Smooth Fox Terrier movement needs more iconic figures from pop culture. 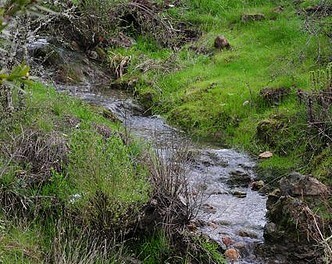 Perhaps a Disneyesque adventure starring Lucy and Oscar on an adventure in wine country with the Phantom Chicken and a Western Pond turtle with the local coyotes and mountain lions as misunderstood villains. I’m sure Lucy and Oscar would be willing to sacrifice their modesty in this venture, but they’re too shy to tell you. And thanks Val from Sandy! Love it! What a great piece, Lisa. I can just see those four cavorting and having a grand time together at your digs. One thing: at only 6 months old, could the question of corrupting a minor be raised over what surely would be some adventure-packed activities, games and er, clever Smoothies forms of potentially rowdy entertainment? Or is teaching the next generation those secret Smoothie tricks simply a right of passage or initiation? India is now much older. If you saw the excellent movie, A Single Man, you’ll recognize Angus and India as the stars. For some odd reason, the Academy chose to nominate Colin Firth and Julianne Moore for Oscars when it’s clear they were only supporting players. Awesome Lisa! Nice to see my words out there, even the F bomb. (It does come to that!) Keep the dream alive for play dates with model/actors. It is what all my gay friends do. And we all know they are the Smoothie’s BFF! Great blog. Having been a Smooth lover for 40 years, I can’t imagine living with any other kind of dog! Fabulous post! We get the Jack question all of the time, and of course, Nutmeg is far more beautiful that any Jack Russell! Love the photo of Angus and India. Someday I must find out how India and Meg are related–they have the same lovely face and side spot, just on the opposite side. And terrier people are wonderful, intelligent, tenacious, creative people. I’m so grateful for the WWW for bringing us all together. A terrier get-together would be such a rowdy hoot! The only bad side effect of Terrier Cyber-Playdates has been seeing how beautiful and beautifully groomed other terriers are. Lucy’s clearly got the looks and conformation of our duo, but she does have that weight problem. Oscar is just all wrong with his sticky up ears, his wonky tail and his immense energy that seems to prevent him from putting on any weight. And then both of them are pretty scruffy Country Terriers. And when Dad “grooms” them, the results are pretty scary. I think we need to step up our game here. So incredible to find a smoothie blog. Yes Lisa, India’s older. She had her third birthday during the filming of “A Single Man”. I will send a photo of the birthday party the dog trainers gave her. 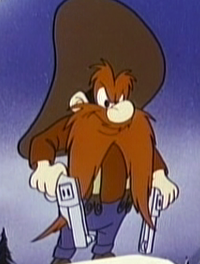 They were sent away for almost six weeks to train for their roles in the film. The scene with the two dogs, Jim and George on the sofa was a nightmare to film. India kept popping her head up because the overhead boom mic looked like a plush toy flying around. Then Angus wouldn’t lie down. He would only face the trainer who was off screen hoping for a treat. Tom said a few takes featured the trainer crawling into the shot to get Angus to lie down. Thanks so much Richard for showing up with the behind the scenes A Single Man scoop. But do you think India “freaked” at her big scene because she was being kissed by COLIN FIRTH!! I’m sure with a less swoony leading man, the terriers will rise to the cinematic occasion. As I mentioned before, I think Tom’s Magnus Opus Terrianus is still to come. Hope the doggies make more cinematic appearances. I’m with Lisa, if Colin Firth were leaning anywhere near my ears, I would have at least a tiny conniption. One can forgive lovely Miss India for being a bit nervous. And Lisa, your dogs are lovely, just the way they are. One thing I love about the World-Wide Terrier Network is seeing the variety of SCFTs. Until the week before Nutmeg came to live with us, I’d honestly never even seen one, so we had to ramp up on how to live with one quickly. I love how each dog has such a clear and distinct personality that seems to shine in his or her face and body language. Meg speaks to us daily in everything but words. I imagine sometimes all of you feel the same way. I must meet Oscar and Lucy. My co-workers think I’ve lost it as I sit and read and LAUGH OUT LOUD. Thank you for publishing what many smooth owner and breeders think everytime we’re told, not asked, what a great Jack Russell we have. Love the blog, you do such a wonderful job describing what life is like with this fun loving dogs. I wish I could lay claim to that “dialogue” but it’s from Sarah Cox, Owner to the late lamented Blogging Smooth, Raleigh Pop. Just came across this blog, having watched Single Man and being a smooth owner myself. Very interesting to note the “buttered toast” smell of ears. Moonie, our Smooth has ears that smell like chocolate crepes. We loved our Jack Russell but have a beautiful Rat Terrier now. Everyone thinks he’s a Jack but we know the difference. In fact Rats are part SFT. Our Rat has the most wonderful disposition and is so patient with our granddaughters.